In October of last year, a lot of exoplanet astronomers gathered in Observatoire de Haute-Provence (OHP), France, for OHP2015, a conference on “Twenty years of giant exoplanets”. Many thanks to SOC chair Isabelle Boisse, and LOC chair François Bouchy for their efforts putting it together. For those who don’t know, OHP is where the field of exoplanetary astronomy got jump-started with the discovery of 51 Pegasi b by Michel Mayor and Didier Queloz using the ELODIE instrument (which we got to see when touring the facilities). Today, the same telescope uses the SOPHIE instrument to continue the precise RV tradition there. The site itself reminded me a lot of Lick Observatory, actually (which is not too surprising; both are very near regions world-renowned for vineyards growing similar grapes). I had never been, and it was neat to get to travel to France and make minimal use of my high school French. We stayed in the dormitories and got to visit a local fromagerie. What I liked about the conference is that it focused on the first class of exoplanets discovered (pulsar planets aside), which is one that often gets forgotten when we focus on the (much more numerous) smaller and potentially terrestrial bodies being found by Kepler and at low amplitudes by RV. These are the mature, presumably gas-giant planets orbiting at tenths to tens of AU from ordinary stars. 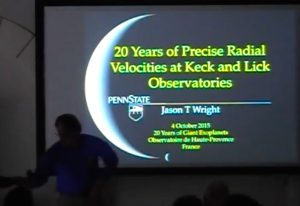 I was asked to talk about the 20 years of precise RVs at Lick and Keck observatories. I started working with Geoff Marcy in 1999 or 2000, less than 5 years after the discovery of 51 Peg b, when there were still only a small number of exoplanets known. I had heard enough stories from Geoff, Paul Butler, Debra Fischer, and Jeff Valenti, that I felt I could cover the territory pretty well. So,I asked around and put together many slides of “vintage” photos showing things like the original Lick iodine cell and the lab at San Francisco State University where Marcy, Butler, and others got that planet search running. I also recommend this “personal history” of the same material, told with greater authority and detail by Paul Butler on the Pale Red Dot site. Next time: where it all started. This entry was posted in science, Uncategorized and tagged science on March 28, 2016 by jtw13.